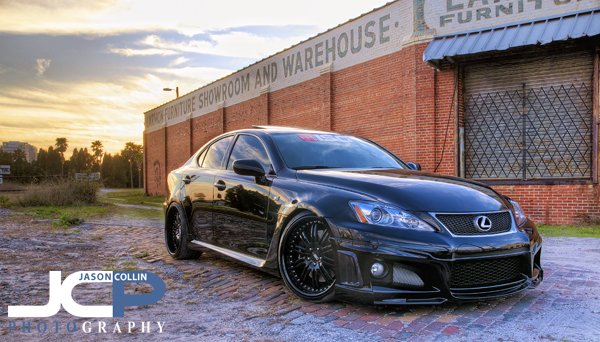 2008 Lexus IS F in black - 7-bracket HDR in Ybor City, TampaWhen I was contacted by ISG (In Sixth Gear) to photograph a black 2008 Lexus IS F, my third favorite car in the world, it was rather easy to say yes to that job! In fact it would be harder to have a more fun commercial car photography job in Tampa. A few days earlier I went to Ybor City to scout locations (photos without car) and found the above brick road by rail road tracks spot, which was what the client had requested. 2008 Lexus IS F black showing custom carbon fiber front spoiler - Ybor City, TampaThis was the client's own daily driver car. He had a number of customizations added to it including a very low profile front carbon fiber spoiler, special 20" black wheels and perhaps most noticeable was the throaty prototype exhaust system. The V8's could be heard rumbling loudly even at idle. When revved you can hear it two blocks away. 2008 Lexus IS F black - 7-bracket HDR in Ybor City, TampaAll the locations I found in Ybor City were within a few blocks of each other in the same old brick warehouse district. The client mainly wanted shots composed in a way so they could be used on his website, which meant leaving space on the left side for a vertical menu and space on the bottom of the image for text overlay, as can be seen in the above shot. 2008 Lexus IS F black - single exposure processed in Topaz Adjust 3 - Ybor City, TampaWhile waiting for the sun to go down a bit more, I took a few tight shots of the IS F for the client's own personal use, as well as to use as wallpaper on my own desktops! The IS F has a unique, angled quad-exhaust system that is at an even sharper angle with this prototype exhaust system than the stock tailpipes. 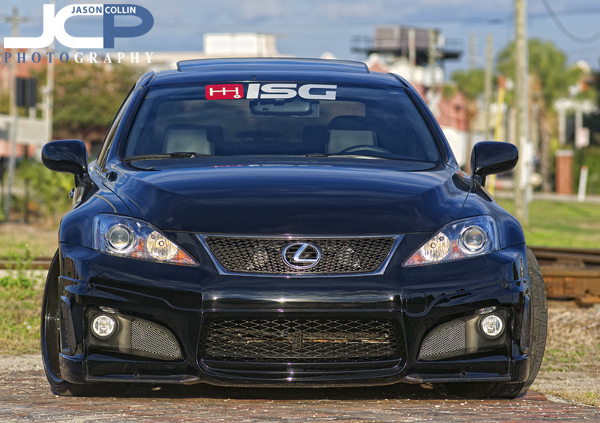 2008 Lexus IS F with custom carbon fiber front spoiler - Ybor City, TampaThe client's customized IS F looked especially menacing from the front. The car overall was lowered with an even lower profile front carbon fiber spoiler. Needless to say one has to be quite careful going over speedbumps! 2008 Lexus IS F - 7-bracket HDR - Ybor City, Tampa warehouse districtThe client is actually selling this car and replacing it with a BMW M3. I hope the photographs help him remember his time with his IS F.